Some people firmly believe that a house is not a home without flowers or potted plants. This is never more so than at Christmas time. With all the splendid flowers available during this special time of the year it is fun and easy to add some floral touches to your Christmas décor and dinner table. Whether it be a simple centerpiece for your Christmas dinner table or an elaborate arrangement for the front entranceway flowers add a magical touch of beauty to Christmas. 1. When creating centerpieces for the Christmas dinner table be sure that you either place them strategically or keep them to a low enough level that they will not inhibit the ability of your guests to talk across the table to one another. To avoid this you can create a long, low profile table centerpiece that incorporates lots of greenery and a few flowers to give it a pop of color. The color of your flowers does not necessarily have to match your table décor but should be at least in complimentary colors to keep the overall look of your table in balance. 2. You have likely heard the saying “Less is more”. In the case of flower arrangements, if you don’t have any particular skills at arranging flowers you may elect to use subtle touches such as single flowers in bud vases along the length of your dining table. These can be fresh blooms or you could choose to use the stunning gold and platinum roses that are available at Eternity Rose. These gorgeous flowers will look equally good laid strategically along the length of the table. Because of the timeless elegance of these gold and platinum dipped roses they can be used for any special occasion or put on display all year round. 3. When planning a large floral display choose the vase carefully. First, it must be large enough to accommodate the number of flowers and amount of foliage/greenery you will create your arrangement from. It should also compliment the colors used in the arrangement, but is not necessary to be a matching color to any of the elements of the display. Be aware that tall vases with small bases can be easily knocked over by small children so if planning a large arrangement for your front entrance be sure to select a vase that will not fall over easily. For single blooms or the gold and platinum dipped roses available from Eternity Rose you might like to consider the elegant and classic styles of bud vases available on their site. Vases do not have to be traditional glass or ceramic containers. If you like a rustic look consider using small metal buckets or preserving jars for small bunches of flowers. 4. Flower arrangements do not have to consist of only flowers. Consider the use of pine cones, small apples, twigs, feathers, small gourds and other additional elements along with a small number of flowers to turn your arrangement into a large, gorgeous display that has lots of fun elements that all come together well. Gold wire is another interesting element in a festive flower arrangement or silver if that is more in line with your décor. Candles can also be used provided they are strategically placed so the flame when lit will not set fire to anything, or wilt blooms. 5. A window box can be a great way to create a display that consists of foliage, flowers, pine cones, candles and a myriad of other decorative touches. It can be placed in the center of a long table to work as a centerpiece or on a sofa table or cabinet where everyone can admire it. The advantage of putting your floral elements within a window box is that you can place things in an arranged manner and not worry about stems showing or anything falling over. For a more decorative touch consider covering the window box in holiday paper, silver or gold foil or paint it to match or compliment your Christmas décor. If you have a green thumb you could grow your own plants in the window box and use them as the basis for your arrangement, adding other elements to the box to complete the arrangement. 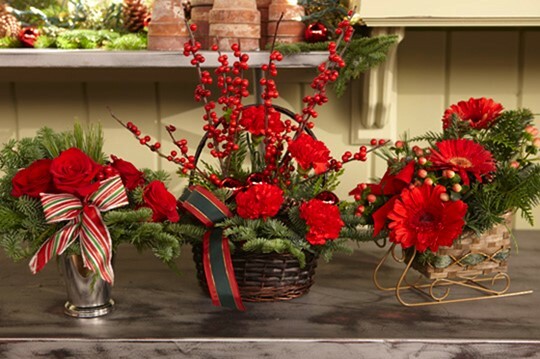 Additional tip: While there may be a limited variety of blooms available during the winter months there are still plenty of flowers that will add a wonderful splash of color to your Christmas décor. Let your creativity with flowers and other elements to create a floral display that will be unique. There are no rules dictating the colors or elements you must include so let your imagination soar to create floral pieces that are beautiful and festive this Christmas holiday season.